God’s peace is always there for us, Kelsey, but sometimes we are too overwhelmed, angry, hurt, grief-stricken, or just plain rebellious to turn to Him, seeking it. Or in my case, just plain ol’ dense. It seems I always wait till I have nowhere else to turn before I turn to God for help. If I ever develop any smarts, I’ll remember to turn to Him FIRST! You’re making progress in the right direction, Kelsey. Good job, both the writing and the life decisions. Brilliant! Inspiring! What a great post! You are right–in the midst of struggle, pain, and uncertainty–it just doesn’t make sense to choose peace. That is, of course, unless you are personally related to the Author of all Peace! And you are such a child of God! I can totally relate to your anxiety. thanks for being such a great model–through good times AND the unavoidable difficult times we experience. 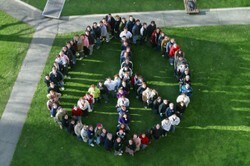 LOVE the peace sign of people! Isn’t that just like God NOT to listen to our plans and own with His own? I can’t tell you I have done/said something similar. Wouldn’t things go so much easier if we just ask Him first? Right there with you. Sounds like God is doing some great things with you. He always seems to stir up the waters to call us into deeper waters. And now I’m thinking a new Beth Moore study would do me some good:-) Love her studies! I really liked (did I really say that?) the part about submission to God for peace in our lives and I’m glad that you mentioned it here again. We always need to remember that God’s plans for us are ALWAYS better than our concoctions!! Thanks for your thoughts! So glad God is talking to ya!! Life sureis better, not to mention peaceful, when we listen to him and seek his peace. How wonderful your hubby and kids got such a wonderful vacation! There is nothing like His peace. I love that you pointed out the choice aspect. So many times we like to cast ourselves as the victim of a lack of peace. This was very similar to what God was trying to show me. Very similar. And I agree, about continuing to study. I wish I could stretch each of these aspects out for a whole month there’s just SO MUCH!!! I have such a hard time remembering the whole “His ways are not my ways” thing. I get so caught up in the way I want things to go, I forget that ultimately God knows what’s best for me, even when I just am too stubborn to see it. Oh my word, how weird is it that I wrote about “Letting go and letting God” not ten minutes ago? Your posts always speak to my heart, Kelsey, but at this moment, seeing that we are on the same mind wave just leaves me in awe of God’s speaking spirit. I lose my sense of peace when I get too focused on the uncertain things in my life — and the chaos of trying to stay balanced when there aren’t enough me’s (is that a word) to go around. I need to keep my eyes on my Master and not on the sea — man is it hard! Even if it started as means to keep the kids home, I think it is so great you turned to God to find the peace in letting them leave. See what that has opened up for you? I don’t think you would have been relaxing and going out and enjoying yourself in your new social life even you hadn’t found that peace first. You have a lovely, teachable spirit! You may not feel like one, but you’re a great example. Thanks for sharing this. Although I’m not participating in the study, I’m getting a lot out of it through all of you. You are ministering to me in ways you don’t even know. I haven’t read everyone’s comments. Sorry if I repeat. I love that peace is a choice.For me, it’s when I choose to trust him even when I personally wouldn’t rather his will be something else! Good post. I know that submitting to His ways are sometimes so very hard…I don’t know what I can’t sometimes, but when I do, oh it is so much better to get through this life. You know, some days I just wish I would be already in heaven and can talk things over with Him face-to-face. But I guess He is not finished with me down here. You are so right, Kelsey, about SUBMISSION…there’s just no peace without it. And when I have those moments where I’m so angry that I can’t seem to find peace anywhere, I sing or pray until I just surrender. Which brings us back to submission. You know what – this is my second time through LBY and I am still studying all of it! We do have a choice of submitting to the Holy Spirit or not. I don’t know why I have such a hard time with that – because life is certainly much easier and peaceful when I do! hmmm. Good timing. I really kind of needed to hear that now. Hubby was just telling me yesterday how much I need to “just let it go!” Easier said than done, but I’m trying. Great example of choosing God’s peace over our own demands. Thanks, Kelsey!